work, and mother nature makes the outcome unpredictable, but we find great satisfaction in producing a quality product for you to enjoy. We are both fourth generation sugarmakers and appreciate the lifestyle that the farm has allowed us to lead on Ted’s family farm. We were lucky to be able to raise our three children on the farm and enjoy having our seven grandchildren visit us in the sugarhouse. 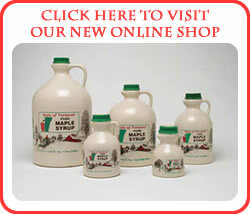 Now that Ted is retired from dairy farming, we have more time to devote to our maple business. Although the maple sugaring season only lasts for a couple of months in the spring, stewardship of the land is a year-round effort. We take pride in sustainably managing our sugar woods so that they will be healthy for our use and for future generations as well.